Whatever your concern, be it back pain, restricted movement, headaches, trouble sleeping, poor health, stress, depression, fitness limitation, unexplained pain, digestion, hormonal or circulatory troubles… YOU Massage Therapy are here for you and we can help. At Bedford Place YOU Massage in Southampton helps people to recover from pain and stress, to deeply relax and heal all day every day from our beautiful massage studio. We are dedicated to providing you with the most suitable Massage Therapy, professionally tailored for your individual needs. If you are looking to treat a new or on-going problem, or seeking out the perfect pampers session, try out a new style of massage or take a little time out. You will feel confident. You are spending your precious time and money at the right place. 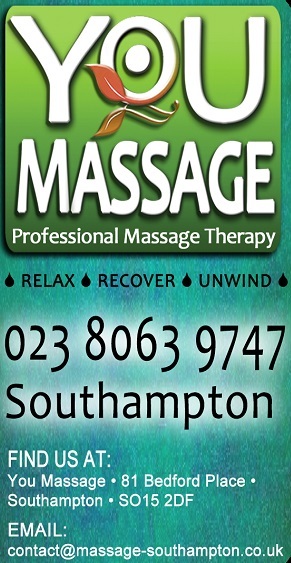 YOU Massage Therapy is the first choice for a Southampton Massage. You can feel 100% secure, relaxed and well cared here. YOU Massage in Southampton offers a wide range of deals and discounts to all our clients with an aim to keep massage affordable. Our knowledgeable team is continuously developing their skills and knowledge and will get to know you and talk to you about small changes you can make in your life for big improvements. As well as Massage, we encourage stretching, straight posture, relaxation and a positive attitude. All of the YOU Massage Therapists are qualified in both Holistic and Remedial Massage Techniques! Widely accredited and protected by comprehensive professional liability insurance, you can be sure you are in the best possible hands. Before they treat our clients, new Therapists have been vetted by our loyal clients and staff. We take the time to train Therapists in the YOU way of giving quality, unique Massage. YOU Massage Southampton Therapists are exceptionally talented and passionate with a broad level of experience from many therapeutic backgrounds. We constanly develop our skills by learning together and with other professionals such as Osteopaths, Phsyiotherapists and Massage Teachers to keep our knowledge at the fore-front of industry understanding.